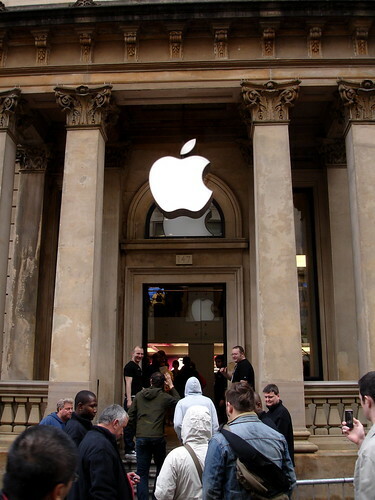 08:10 – Myself, Graham and Roy meet-up and head towards the Apple store. 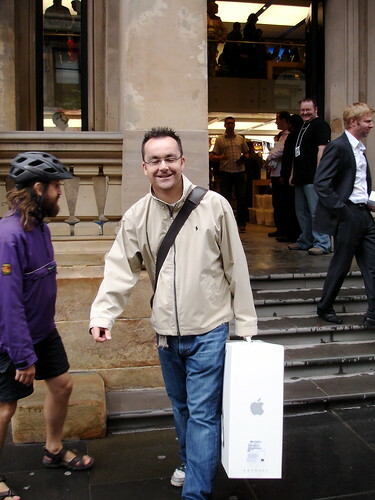 The plan was to get a breakfast, get to the store before 9, enjoy the opening and for Roy to buy one of the new iMacs. We walked down and could see around 100 folk queued up already. Looks like it was going to be popular. We strolled around looking for food like desperado’s. Central station came to the rescue. Tasty (but expensive) bacon rolls later we headed back to the queue. 08:35 – Back in the queue we start to look around and notice…geeks. Obviously quite passionate and loyal to the Apple brand but the geek quotient per square yard must have been higher than even Maplins during a new catalogue launch. The most ardent fanboys could be spotted quite easily. The queue had also grown to around 300 odd people with more arriving thick and fast. 08:45 – A cheer goes up as the doors to the store are finally opened. Seemingly they were left closed even during last nights friends and family invite – they had to use the side door – as they wanted the doors to be opened for the first time this morning. 08:53 – All the staff come out to cheer the folk in the queue. The queue cheers back. A nice if slightly cheesy touch. You could see that the staff were pretty pumped up for the opening as were some of the people in the queue who looked visibly excited. 09:00 – Doors open, massive cheering and the people at the front start to enter. As the queue starts to move we get our first view into the store. As people enter they are cheered on by two rows of staff handing out free t-shirts. The cheering continued for everyone entering while we were in the store as well. Lot’s of energy and built up quite a good atmosphere. 09:15 – We’re in. I feel a bit embarrassed at the cheering but no matter – we’re here – lets get buying. 09:15-09:45 – The store is very nicely modernised. It feels a bit basic in some areas especially when you walk in and see the basic display tables with lot’s of iPods. However it feels spacious and the glass staircase is a triumph. I’m sure on a normal day the store will feel a lot less cramped than it did today. Roy did pick up his iMac and myself and Graham bought one of the new keyboards. 09:45 – Leaving the store and the queue still has at least a couple of hundred people in it with more still joining. Roy gets congratulated by members of the queue for his purchase. is there any other brand that attracts this loyalty? Looking around at the the trendy clothing stores what must they be wondering? Why didn’t their opening attract hundreds on a damp and dreary Saturday morning? Imagine how busy the iPhone launch will be! As for the keyboard, it’s a lot comfier to use than the existing one that came with the older iMac. It’s also helps accuracy, I guess as the keys actually have more space between them. I also prefer the shorter throw each key has. Not a bad way to spend Â£30 seeing as it’s the primary interface to the iMac. I’ve lost the wireless keyboard but gained two fast USB 2.0 ports that are easy to get to. I can understand why people were concerned initially about the keyboard but after spending a couple of hours with it I’m convinced that it’s a better design. Hopefully it won’t show the keyboard fluff as badly as the last design. Almost forgot, full set of pictures from this morning available on Flickr. That means that you were in the queue when I arrived. Unfortunately my wife still isn’t 100% and we couldn’t really stand about in the drizzle. Hit Starbucks but had to go home. Ahhh. Shame. Sorry I missed you.